Shah AA, Sainani NI, Kambadakone AR, et al. 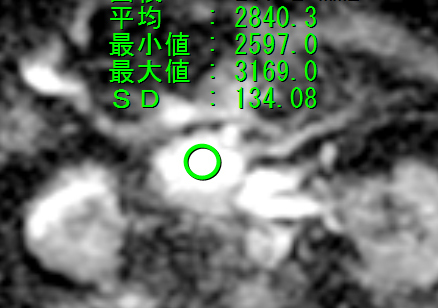 Predictive value of multi-detector computed tomography for accurate diagnosis of serous cystadenoma: radiologic-pathologic correlation. World J Gastroenterol. 2009 Jun 14;15(22):2739-47. Choi JY, Kim MJ, Lee JY, et al. 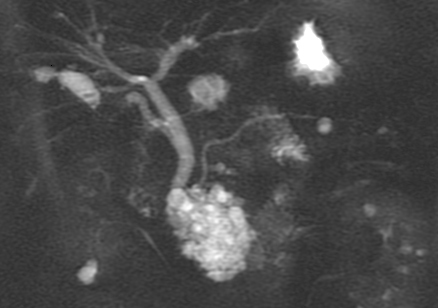 Typical and atypical manifestations of serous cystadenoma of the pancreas: imaging findings with pathologic correlation. AJR Am J Roentgenol. 2009 Jul;193(1):136-42. Kim SY, Lee JM, Kim SH, Shin KS, Kim YJ, An SK, Han CJ, Han JK, Choi BI. AJR Am J Roentgenol. 2006 Nov;187(5):1192-8. Kalb B, Sarmiento JM, Kooby DA, et al. 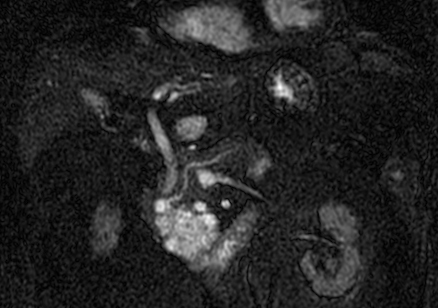 MR imaging of cystic lesions of the pancreas. Wang Y, Miller FH, Chen ZE, et al. Fukasawa M, Maguchi H, Takahashi K, et al. Clinical features and natural history of serous cystic neoplasm of the pancreas. Pancreatology. 2010;10(6):695-701. Epub 2011 Jan 18. Lv P, Mahyoub R, Lin X, et al. Differentiating pancreatic ductal adenocarcinoma from pancreatic serous cystadenoma, mucinous cystadenoma, and a pseudocyst with detailed analysis of cystic features on CT scans: a preliminary study. Korean J Radiol. 2011 Mar-Apr;12(2):187-95. Epub 2011 Mar 3. Cho W, Cho YB, Jang KT, et al. 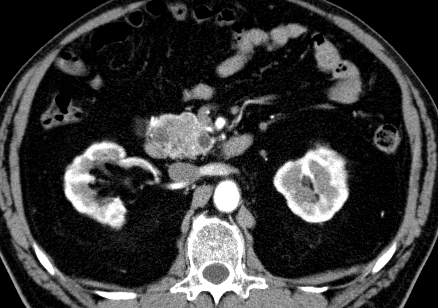 Pancreatic serous cystadenocarcinoma with invasive growth into the colon and spleen. J Korean Surg Soc. 2011 Sep;81(3):221-4. Epub 2011 Sep 26. 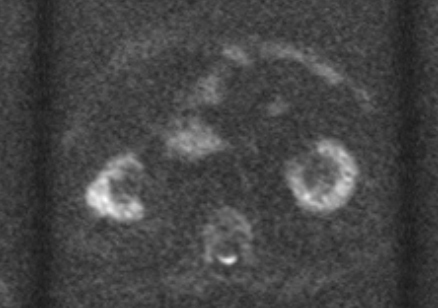 Bano S, Upreti L, Puri SK, Chaudhary V, Sakuja P.
Imaging of pancreatic serous cystadenocarcinoma. Jpn J Radiol. 2011 Dec;29(10):730-4. Epub 2011 Oct 19. Lahat G, Lubezky N, Haim MB, et al. Isr Med Assoc J 2011 May;13(5):284-9. King JC, Ng TT, White SC, Cortina G, Reber HA, Hines OJ. Pancreatic serous cystadenocarcinoma: a case report and review of the literature. J Gastrointest Surg. 2009 Oct;13(10):1864-8. Epub 2009 May 21. Review. Khashab MA, Shin EJ, Amateau S, et al. 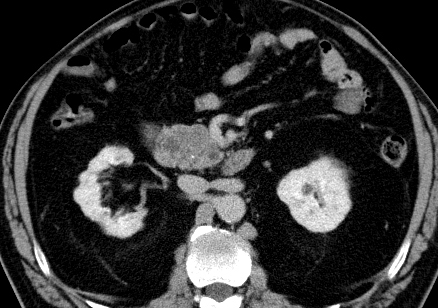 Tumor size and location correlate with behavior of pancreatic serous cystic neoplasms. Am J Gastroenterol. 2011 Aug;106(8):1521-6. doi: 10.1038/ajg.2011.117. Epub 2011 Apr 5.